Superior Spider-Man: The Complete Collection Vol. 2 Review – AiPT! It’s the end of Superior Spider-Man. 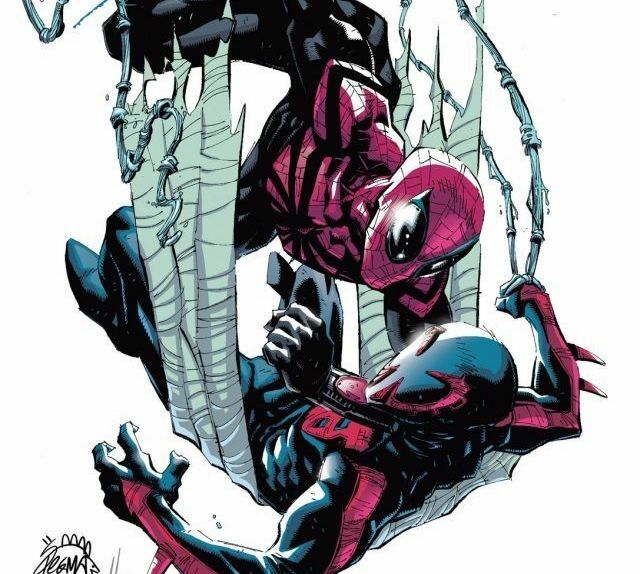 Superior Spider-Man was a refreshing take on Spider-Man that was so unique I was surprised they even tried it at all, let alone let it go 33 issues. I reviewed every issue including the complete collection which gets a wrap up second volume this week. This collection not only wraps up the story arc of Doc Ock taking over Peter Parker’s body, but also contains the Superior Venom story, Spider-Man 2099 entering the 616, and more. The stunning conclusion of Otto Octavius’ superior saga! Having taken over Peter Parker’s body and life, Doctor Octopus is determined to be a better Spider-Man than Peter ever was. And if his clashes with Spider-Man 2099, the Black Cat and Blackout are any indication, he just might be! But as “Peter” earns his doctorate and starts his own company, dark forces gather. Flash Thompson is back in town, and he’s brought the Venom symbiote with him! Both know Spidey very well, so will they sense something off about the Superior Spider-Man? And when the Green Goblin takes control of New York’s Underworld, Otto faces his final battle. The Superior Spider-Man must bring down the Goblin Nation – even if it means his own defeat, and the rebirth of an amazing hero! Not only is this a must read if you’ve bought the first complete collection, but it’s also more necessary to read than ever since Christos Gage and Mike Hawthorne are kickstarting a new ongoing for the character this December. This collection also showcases Superior Spider-Man’s turn as more of a villain than ever before. The scoundrel. If the first volume set up how Doc Ock got inside Peter Parker and gave us a taste of what a super smart and cocky Spider-Man would be like, this volume is all about disassembling that formula. Doc Ock is starting to realize how hard it is to be Spider-Man as he messes up his job, his love life, and even the hero aspect of his life. That includes his tasteless way of being a hero (like violently slashing at bad guys), but read in one sitting it’s clear series writer Dan Slott (with Christos Gage) wanted to show with enough pressure Doc Ock could not handle being Spider-Man forever. That leads to a payoff ending that makes sense which paves the way for Peter’s eventual return. This is a massive collection which highlights how many cool ideas Slott and Gage stuffed into this series. Superior Venom, for instance, shows how Doc Ock would deal with so much power (read: not well) and there’s a strong buildup to a Goblin showdown at the very end. Mary Jane continues to be developed well too, as she attempts to rebuild a club she manages. The inclusion of Spider-Man 2099 is also a fun highlight which spilled into his own series. When I originally reviewed each issue of this series I tended to go with a 9 out of 10 for a reason and that’s because each issue feels so fresh. The art is shared by quite a few highly talented people like Humberto Ramos, Ryan Stegman, Guiseppe Camuncoli, and Will Sliney to name a few. This series has a decidedly darker tone and it shows in the heavier inks and shadow work. Each of these artists has a unique style, yet all of them have made their mark on the character in this series and future series to come. The story admittedly shifts way too quickly at the very end, normalizing Peter as Spider-Man shockingly fast. After 30 issues of Doc Ock proving he can be Spider-Man he quickly loses confidence and submits to giving up the mantle. That isn’t as satisfying as one would like, especially given how pompous he’s been every step of the way. Once Peter is back in the story he has to do a lot of laborious explaining, which is tiresome. The way this story unfolds at the very end it’s as if someone told Slott two issues prior to the end he had to give Peter back the body when there may have been 10 more issues planned. It makes the ending come too quickly and feel unearned. Regardless of how it ended, this remains one of the freshest takes on a mainstream superhero ever. What was done here was ahead of its time and it took a big chance on a rather cool idea. Read this one to get the whole story. Dive in and enjoy the wrap up to a series that was so good it's coming back for an ongoing this year.